as far as the area we rode. We parked at a small pullout along the farm road and were quickly on some pretty decent trails. 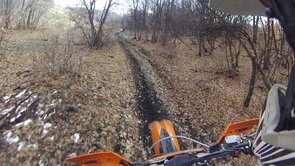 The leaves and wet conditions made the trails slick in most areas, but we had a great time weaving through the trees and hills. 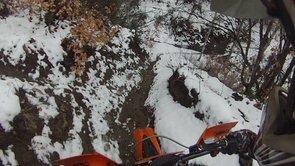 There is no real route that needs to be followed here, but you can't call it a freeride area either. There are enough existing trails however to keep you exploring and happy for a while. The few hours we spent riding was not enough to really satisfy us, but gave us a good taste. We left wanting to go back when the conditions are better to explore and ride. Most of the terrain is easy to moderate, but there were a few good climbs that proved to be as much as we could handle and more at times. There are a few small river crossings as well, and the scenery is quite nice. We started at about 5,400 feet and rode to 7,800 before the snow really stopped us. click for Directions to the staging area from your location. Looks fun! I hope I can get over there this summer to check it out! Post up when you're going back!